Founded in 1986, Double Double Pizza and Chicken was created to provide our customers with the tastiest and most affordable meals available. Priding ourselves on fresh ingredients and the best chicken available, we create nutritious meals for lunch or dinner! 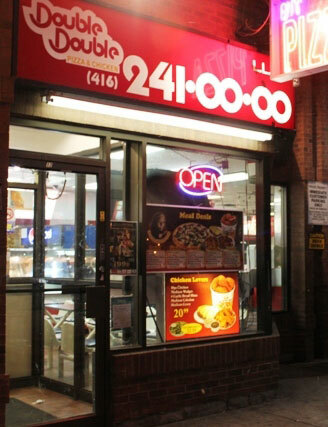 With over 35 locations serving the best pizza in Toronto, Waterloo, Hamilton, London, Oshawa and other cities in Ontario, there's a Double Double Pizza & Chicken near you! Visit our locations page to find the closest Double Double near you and give us a try today. You won't be disappointed! Download our current flyer for all of current deals and specials! Join our eClub Receive delicious great offers directly to your email. Receive delicious great offers directly to your email. Products may not be as pictured. Minimum delivery orders $10.99. Taxes are extra. Prices are subject to change without notice. Debit surcharges apply. Limited time offer. Some restrictions may apply.